Fue descubierto en 1962 pero recién con la tecnología actual se pudieron juntar todos los fragmentos. Expertos griegos y de la Universidad de Oxford lograron traducir el papiro heleno más antiguo del mundo, que data del siglo quinto antes de Cristo. El "Papiro de Derveni" fue hallado en el año 1962 en una antigua tumba cercana a Tesalónica, la segunda ciudad más populosa de Grecia. El texto describe la filosofía basada en los poemas órficos, un movimiento religioso secreto que tuvo su auge 2.400 años atrás. En el se puedo leer una profunda reflexión sobre la naturaleza de los dioses. El trabajo de los arqueólogos requirió de extrema precisión en la reconstrucción del papiro para su posterior lectura, dado el mal estado de los fragmentos por el paso del tiempo. Greek and foreign experts have used cutting-edge technology to decode the Greek text of the worlds oldest literary papyrus more than four decades after its discovery, it was revealed yesterday. 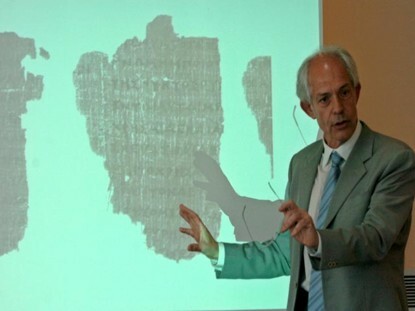 It is particularly important to us as it is the oldest (papyrus) bearing Greek text, Apostolos Pierris, director of the Patras Institute of Philosophical Research, told Kathimerini. Experts from the institute, Oxford University and Brigham Young University, who decoded the papyrus and aim to reassemble it, are to hold a press conference in Thessaloniki today. The papyrus is believed to be an invaluable document for the study of ancient Greek religion, philosophy and literary criticism. This is the first comprehensive study of the Derveni Papyrus. 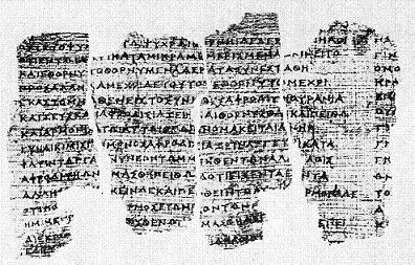 The papyrus, found in 1962 near Thessaloniki, is not only one of the oldest surviving Greek papyri but is also considered by scholars as a document of primary importance for a better understanding of the religious and philosophical developments in the fifth and fourth centuries BC. 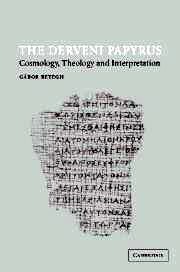 Gábor Betegh aims to reconstruct and systematically analyse the different strata of the text and their interrelation by exploring the archaeological context; the interpretation of rituals in the first columns of the text; the Orphic poem commented on by the author of the papyrus; and the cosmological and theological doctrines which emerge from the Derveni authors exegesis of the poem. Betegh discusses the place of the text in the context of late Presocratic philosophy and offers an important preliminary edition of the text of the papyrus with critical apparatus and English translation. Text and translation; 1. The find; 2. The first columns; 3. The reconstruction of the poem; 4. The interpretation of the poem; 5. The cosmic God; 6. Cosmology; 7. Anaxagoras; 8. Diogenes of Apollonia and Archelaus of Athens; 9. Physics and eschatology: Heraclitus and the gold plates; 10. Understanding Orpheus, understanding the world; Index Verborum. there is no doubt that it will continue to prove controversial and hard to understand. But Betegh has given us a commentary that matches the texts richness. The Heythrop Journal. La mitología griega también recoge en sus relatos el origen del Mundo. Pero debemos tener presente que para el pensamiento religioso griego una cosmogonía suponía no solamente el origen de nuestro mundo físico, sino también el origen de los dioses, el origen del hombre y la organización social. La literatura griega proporcionó diversos textos cosmogónicos, sin embargo la mayoría se conservan bastante mal. Entre ellos conocemos la teogonía de Hesíodo, la de Apolodoro en su Biblioteca, la teogonía de Eudemo, la de Jerónimo y Helanico, la cosmogonía de las Rapsodias y la recogida en el Papiro de Derveni, las cuatro últimas son conocidas como "Teogonías Órficas", ya que son atribuidas a Orfeo. Hay una serie de rasgos generales compartidos por estas cosmogonías griegas. En primer lugar, el origen del Mundo parte de la organización de una materia primitiva, que a veces se organiza sola. El segundo concepto fundamental es el de los pares de contrarios. Este planteamiento permitía concebir un gran número de oposiciones: el bien y el mal, frío y calor, día y noche... Otro elemento característico de las cosmogonías griegas es que la ordenación del Mundo no se produce instantáneamente, sino que pasa por fases intermedias en las que aparecen criaturas monstruosas y míticas hasta que el desorden es definitivamente desplazado y desaparece. La teogonía de Eudemo, la teogonía de Jerónimo y Helanico, la cosmogonía de las Rapsodias y la teogonía del Papiro de Derveni se engloban dentro del conjunto de las llamadas "Teogonías Órficas", así designadas porque eran atribuidas a Orfeo. Damascio, autor neoplatónico que vivió entre el 480 y el 544 d. C. aproximadamente, nos habló en su obra de la teogonía de Eudemo, de la obra de Jerónimo y Helanico y de las Rapsodias en su principal obra: Problemas y Soluciones sobre los Primeros Principios. Orfeo fue conocido por ser un excelente cantor y era situado por la tradición en los tiempos de los orígenes, es decir antes de Homero. Su ubicación en esos tiempos se realizó con la intención de que Orfeo fuese considerado más antiguo que el propio Homero y, por tanto, resultase más venerable que éste. Así, varias obras fueron atribuidas a Orfeo, como recurso para garantizar su validez y antigüedad. El orfismo se puede definir como un movimiento religioso místico que se nutría de otros movimientos como el pitagorismo, con el que compartía la transmigración de las almas, el dionisismo, del que adopta el éxtasis, o el culto a Eleusis, con el que comparte el elemento mistérico. El orfismo está muy marcado por el mito y se elaboraron varias teogonías vinculadas con el desarrollo y destino de las almas, siendo hasta cierto punto «antropogónicas». En las cosmogonías órficas podemos realizar una clara distinción entre las "cosmogonías de la Noche" y las "cosmogonías del huevo". "Cosmogonías de la Noche" son la de Eudemo y la del Papiro de Derveni, y "cosmogonías del huevo", la de Jerónimo y Helanico y la de Aristófanes. La de las Rapsodias, es una cosmogonía que sintetiza elementos de ambos tipos: de la Noche y del huevo. ATHENS, Greece - The burnt remains of a 2,400-year-old scroll buried with an ancient Greek nobleman may help unlock the secrets of early monotheistic religion  using new digital technology. 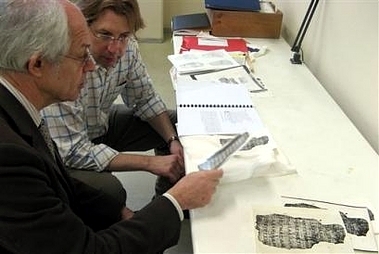 A team of U.S., British and Greek experts is working on a new reading of the enigmatic Derveni papyrus, a philosophical treatise on ancient faith that is Europes oldest surviving manuscript. More than four decades after the papyrus was found in a grave in northern Greece, researchers said Thursday they are close to uncovering new text from the blackened fragments left after the scroll was burned on its owners funeral pyre. Large sections of the mid-4th century B.C. document  a philosophical treatise on religion written in ancient Greek  were read by scholars years ago. But now, archaeologist Polyxeni Veleni believes U.S. imaging and scanning techniques used to decipher the Judas Gospel  which portrays Judas not as a sinister betrayer but as Jesus confidant  will considerably expand and clarify that text. 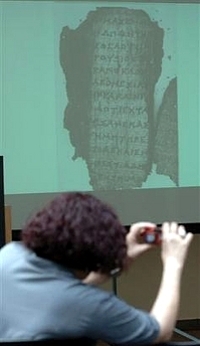 "I believe some 10-20 percent of new text will be added, which however will be of crucial importance," said Veleni, director of the Thessaloniki Archaeological Museum, where the manuscript is kept. "This will fill in many gaps. We will get a better understanding of the sequence and the existing text will become more complete," Veleni told The Associated Press. 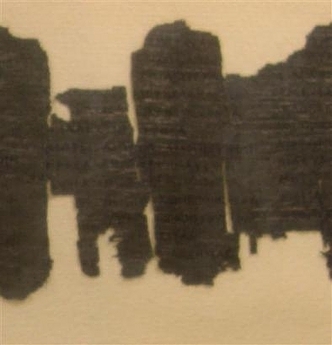 The scroll, originally several yards of papyrus rolled around two wooden runners, was found in 1962. It dates to around 340 B.C., during the reign of Philip II of Macedon, father of Alexander the Great. "It is the oldest surviving book, if you can use that word for a scroll, in Western tradition," Veleni said. "This was a unique find, of exceptional importance." Greek philosophy expert Apostolos Pierris said the text may be a century older. "It was probably written by somebody from the circle of the philosopher Anaxagoras, in the second half of the 5th century B.C.," he said. Anaxagoras, who lived in ancient Athens, is thought to have been the teacher of Socrates and was accused by his contemporaries of atheism. 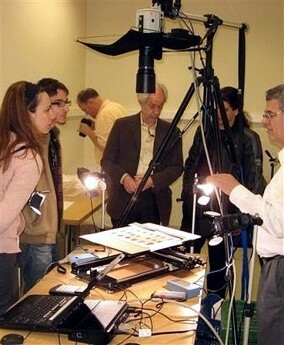 Last month, experts from Brigham Young University in Utah used multi-spectral digital analysis to create enhanced pictures of the text, which will be studied by Oxford University papyrologist Dirk Obbink and Pierris, and published by the end of 2007. A separate, Greek team is also working to produce a new edition by the end of 2006. "We were now able to read even the most carbonized sections, as there were pieces that were completely blackened and nobody could make out whether there were letters on them," Veleni said. The manuscript was thrown onto the funeral pyre that consumed its owner, and laid with his ashes in the grave. "The fire actually saved it, as the papyrus would have been rotted away by damp if not burned," Greek papyrologist expert George Karamanolis said. The book contains a philosophical treatise on a lost poem describing the birth of the gods and other beliefs focusing on Orpheus, the mythical musician who visited the underworld to reclaim his dead love and enjoyed a strong cult following in the ancient world. Ancient legends tell how Orpheus, who could charm wild beasts with his lyre, met a brutal end at the hands of an outraged band of Thracian women who resented his fidelity to his lost sweetheart, Eurydice, and tore him to shreds and threw the remains into a river. The Orpheus cult revolved around the souls fate after death. It raised the notion of a single creator god  as opposed to the multitude of deities the ancient Greeks believed in  and influenced later monotheistic faiths. "In a way, it was a precursor of Christianity," Pierris said. "Orphism believed that mans salvation depended on his knowledge of the truth." Veleni said the manuscript "will help show the influence of Orphism on later monotheistic religions." 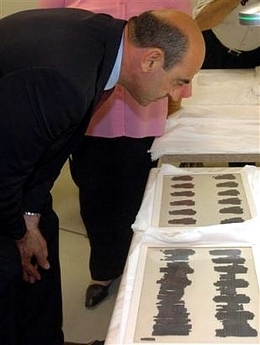 The scrolls remains  about 200 charred scraps  are currently kept in the museums storerooms, sandwiched between glass panels. The Derveni grave, about five miles northwest of Thessaloniki, was part of a rich cemetery belonging to the ancient city of Lete. 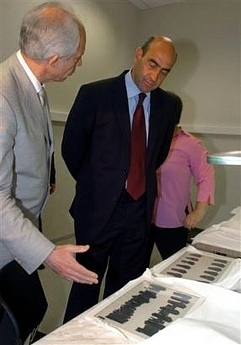 "It belonged to a very rich man, a Macedonian nobleman, warrior and athlete who had a lot of very important and valuable artifacts in his grave," Veleni said. Finds included metal vases, a gold wreath and weapons. ATENAS, Grecia (AP). Una colección de fragmentos de textos calcinados guardados en un museo griego es todo lo que queda de lo que los arqueólogos estiman es el libro más antiguo conservado en Europa, un libro que podría brindar importantes evidencias sobre las más tempranas creencias monoteísticas. Más de cuatro décadas después que el papiro Derveni fue hallado en la tumba de un noble enterrado hace 2,400 años en el norte de Grecia, investigadores dijeron el jueves que están a punto de descubrir nuevos textos de los carbonizados fragmentos que quedaron luego que el manuscrito fue quemado en la pira funeraria de su dueño. El descubrimiento del nuevo texto es posible gracias a un análisis de alta tecnología digital. Extensas partes del libro, un tratado filosófico sobre religión antigua, fueron descifradas hace varios años, pero nunca fueron publicadas. Ahora, el arqueólogo Polyxeni Veleni cree que técnicas estadounidenses de escaneo usadas para descifrar el llamado Evangelio de Judas permitirán expandir y aclarar el texto. "Creo que podrá añadirse entre un 10% y un 20% de nuevo texto... y que será de gran importancia", declaró Veleni, director del Museo de Arqueología de Tesalónica, donde el manuscrito es conservado. "Esto permitirá llenar numerosas brechas. Podremos obtener una mejor comprensión de la secuencia y el texto existente será más completo", dijo Veleni a The Associated Press. El rollo, varios metros de papiro enrollado en torno a dos barras de madera, fue hallado semiquemado en 1962. Data de alrededor del 340 a.C., durante el reinado de Felipe II de Macedonia, padre de Alejandro el Magno. "Es el libro más antiguo que ha sobrevivido" a las inclemencias del tiempo, dijo Veleni. "Se trata de un hallazgo único, de importancia excepcional". Apostolos Pierris, experto en filosofía griega, dijo que el texto podría tener un siglo más de antigüedad. "Posiblemente fue escrito por alguna persona perteneciente al círculo del filósofo Anaxágoras, en la segunda mitad del siglo V antes de Cristo", señaló. Se cree que Anaxágoras, que vivió en la antigua Atenas, fue maestro de Sócrates. Sus contemporáneos lo acusaron de ateísmo. 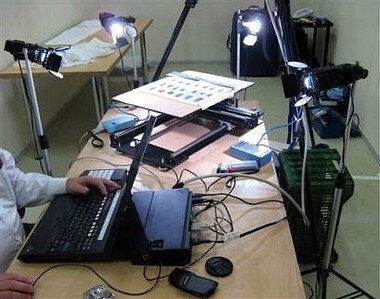 El mes pasado, expertos de la Universidad Brigham Young en Utah usaron análisis digital de multiespectro para crear fotografías ampliadas del texto, que será estudiado por Pierris y por Dirk Obbink, un experto en papiros de la Universidad de Oxford. Los estudios serían publicados a fines del 2007. Gracias a la nueva tecnología "pudimos leer inclusive las secciones más calcinadas", dijo Veleni. Muy buen reporte, sera que hay alguna traduccion disponible en internet del papiro? Artículo maravilloso, inspirador y profundamente evocador. No sé que me maravilla más, si el emocionante trabajo epigráfico ó las implicaciones espirituales a las que este descubrimiento extraordinario nos conduce. es un exelentetrabajopero quisiera que se mostraran mas cerca los papiros de las fotografias y si tienen traduccion esxcribir alguna frase. Deseo felicitaros por la calidad de esta publicación y animaros a continuar con este excelente trabajo. Me han parecido muy interesante las traducciones recientes referentes al llamado Evangelio de Judas y esta nueva cosmogonía. Espero verlos pronto traducidos y publicados por alguna editorial española. Un cordial saludo.